Exiland Backup Free is a powerful yet easy-to-use tool for backing up your important files. Download and configure Exiland Backup Free to automatically backing up your important files, home photos, videos, work files, and documents. Run Exiland Backup Free to protect your files from any threats (virus infection, disk crash, system failure, unwanted changes, and so forth). 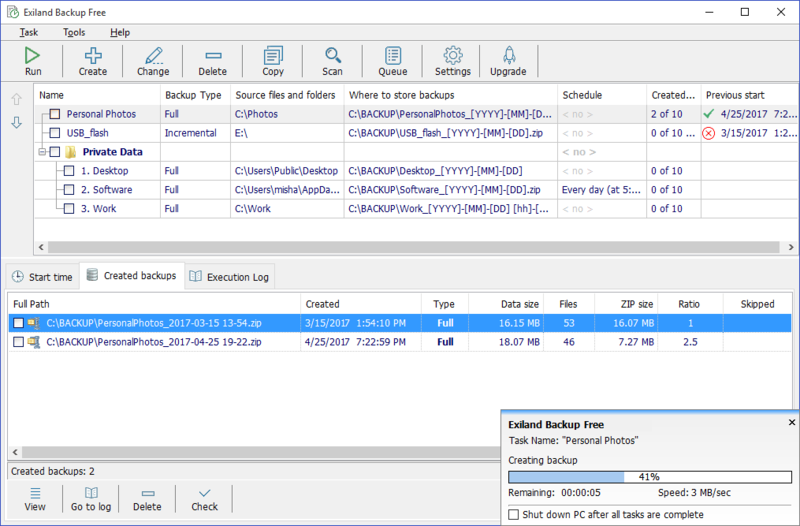 Exiland Backup Free does not have advertizing and any unnecessary features; it is an easy-to-use, fast, simple, and at the same time very powerful utility. You only need to create a task once, select the files and folders to be backed up, specify where to store the backups, and set up a schedule. That’s it! No more action is required from you! If you lose files, you can quickly restore the lost files from a backup to the specified folder or to their original location. The Free edition of the Exiland file backup software is recommended for home. The utility includes only basic features sufficient to create backups on schedule. However, some additional features - such as automatic deletion of the oldest archives, backup duplication to other locations, multi-thread copying, task queue management, copying files by several threads, archive encryption, and so forth - are not available in the free edition. You can learn about all the limitations from the Comparison table of the available editions. We recommend that you use Standard or Professional edition, because they have the extended functionality and do not have the limitations described above. In addition, you get the priority technical support from Exiland Software and access to Your Account on the Exiland Software website. The price of Standard or Professional edition is not high; and there is no expiration date for the license key. How to download and install Exiland Backup Free? You can download the latest version of Exiland Backup Free (free backup utility) on the download page. The program file size is about 5 MB. You can select a type of download: Typical installation (i.e. setup.exe) or Portable (installation is not required). The ZIP archive you downloaded contains the executable setup (i.e. "setup.exe") file. Double-click it and follow the installation instructions. By default, the backup utility will be installed to the following location: "C:\Exiland Backup Free", but you can select another location if needed. The ZIP archive contains the program files that you can unpack to any folder on your disk and then, you can run the "ExilandBackup.exe" file. We created an easy-to-use software for backing up files, that can be used by both system administrators and inexperienced PC users. The program does not require paid registration - you can download it for free and enjoy using it for unlimited time! With low memory requirements, the Exiland Backup Free utility has enough functionality to create backups on schedule. The utility does not contain advertising. Unlike many similar backup programs, Exiland Backup Free gives you full control over the creation of backups. Detailed log allows you to see any problem and provides information on solving it. Also, the program notifies you about the task execution results. The issues with paths longer than 259 characters and unicode characters were solved in the 4.2 version of the program.